To determine success, you roll d20 and add your Offensive Intel and subtract the target system's Intel and the mission difficulty and compare the result to the table. This leaves things fairly intuitive, and allows us to still scale the difficulty of missions slightly so it is still more difficult to kill a Census than it is to infiltrate a system and see what's there. Speaking the the Espionage missions, I'm still of a mind to combine System, Fleet, and Troops, but I'm on the fence. I really need to test A LOT before I can make any value judgments. 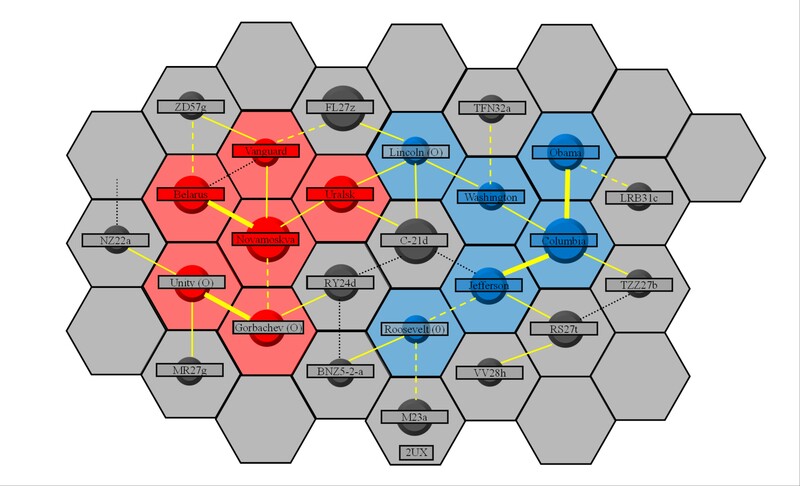 Looking at the B5 map from before, let me attach my empire sheet from that game so we can compare where there was Intel, how much, and see how that would play out under this proposed Intel revision. Right now I'm the Centauri, and I have Intel at Centauri Prime (5) and Etatta (3). I want to find out what is in Dar'kar to prepare for a renewed offensive against the hated Narn Regime. Espionage: Fleet is a difficulty 2 mission. If we use all 5 Intel at Centauri Prime, then the mission would cost us 7 EP (5 Intel + 2 jumps). If we use the 3 Intel at Etatta, then the mission would cost us 4 EP (3 Intel + 1 jump). Obviously, paying more to use the Intel at Centauri Prime is going to be more expensive, but it also increases our changes of success by about +10%. The Centaurum won't authorize the use of Centauri Prime's Intel, but they do release the funds to use Etatta. We order the mission. The Narns have 1 Intel in Dar'kar that will be defending against our mission. This gives us a +3 (Etatta), -1 (Dar'kar), -2 (Difficulty) = +0. As even a chance as you get. The roll is a "1". That Centauri that covered himself in body paint to look like a Narn forgot to cover his head, and his big crest of hair kind of gave him away! The mission fails AND the Centauri are discovered. The Narn now know that the Centauri attempted an Espionage: Fleet against Dar'kar from Etatta. The Narns have vengeance on their mind. They don't have much Intel at Etatta, but they are willing to use it to try and kill some Centauri spies. They use 1 Intel to perform a Sabotage: Intel (Difficulty 3?) at Ettata. This mission costs them 2 EP. It's cheap, but there's not much push behind it, either. They get +1 (Dar'kar), -3 (Etatta), and -3 (Difficulty) for a total of -5. The modified roll is a "6". The mission failed, but the Narns were not discovered. All they're out is 2 EP. If they had succeeded, they would have destroyed 1 Intel in Etatta (or more likely had a chance to, similarly to how there is a 50% chance for Productivity and Census). Dismayed that their last mission failed, the Centauri decide to try and blow up a shipyard at the Narn Homeworld. Go big or go home, right? They will use all 5 Intel at Centauri Prime, and the range is 4 jumps, for a total cost of 9 EP. The Sabotage: Installation mission needs to come back to make this easier to calculate sans command cost (if that goes away), so let's give it a Difficulty 4. Narn has no Intel (whoops!) so the modifier is +5 (Centauri Prime), -4 (Difficulty) = +1. The modified roll is "7". Another failure, but at least they weren't discovered. The Centauri have now spent 13 EP on Intel missions and have nothing to show for it, other than managing to get caught once. The Ipsha are getting annoyed by all of this spying going on, and them not getting invited to the party. They have 5 Intel at their homeworld, too. They would really want to find out what the fleet strength is at Epsilon Eridani, but there's a restricted lane there! And I think it's fitting that, like in 1E, Intel missions can't cross restricted lanes. How rude. The Ipsha could still target Epsilon, however, via a circuitous route through Ross, Sol, Wolf, Orion, and (finally) Epsilon. That is six jumps, which means the cost of the mission is increased by 6 EP from range. We'll dump all 5 Intel in, so this is going to cost us 11 EP. The Earth Alliance, much like the Narn before them, didn't really believe in Intel. There's nothing in Epsilon to stop the mission. The Ipsha have a +5 (Ipsha) -2 (Difficulty) = +3. The roll is a "18". Success, and the Ipsha weren't discovered on their mission! This last example shows that you could now reasonably expect to "reach out and touch someone" with Intel like you're AT&T, but it's going to be more expensive. Establishing listening posts on your enemy's border is going to be cheaper and more cost effective, especially for lower difficult missions or missions that you really don't care what the outcome is going to be. The one other rule update that I would recommend here would be to give an empire a +1 bonus if it has a trade route in the target system. That way trading with an enemy would be a great way to increase your odds of spying on them, too. This style of Intel would dovetail nicely with the Menagerie rules, as you could have traits or governments that affect the cost of missions, effectiveness of defensive Intel, etc. in addition to giving flat bonuses to the roll -- although those would definitely exist. Like "Saboteurs" giving a +2 Intel bonus to Sabotage missions, or "Spymasters" who get +1 Intel to all missions. 1) Any planet with an Intel rating can be used to launch an intel mission. 2) The Intel rating of the system is the base EP cost to launch a mission from that planet. 3) Add the number of jumps distance to the EP cost. 1) A negative modifier to the dice roll equal to the target system's Intel rating is applied to the Mission roll. 2) A negative modifier to the dice roll equal to the number of jumps from the mission system to the launching system is applied to the Mission roll. 3) A negative modifier to the dice roll equal to the Difficult rating of the Mission is applied to the Mission roll. C) Positive modifiers to Mission roll. 1) A positive modifier to the dice roll equal to the launching system's intel rating is applied to the Mission role. This system seems to work VERY well, particularly when Intel is a purchasable stat like Productivity. In my test, I capped it by CAP and not CEN, to represent the idea that you can build up a powerful intelligence apparatus with secret antennas and whatnot on an underpopulated moon or frontier world. I can post some examples a bit later, but this formulation of the intel rules seems to one of the best things to come out of the Galaxy revisions (besides Single Squadron Combat). The only caveat I have from your breakdown is that on A2 and A3 I was allowing a player to split a system's Intel between multiple missions if they wanted to run multiple per turn, but I think your interpretation is cleaner. That way each system can only perform one Intel mission per turn and you don't have to worry about splitting Intel. I think using CAP instead of CEN is also better, as then we don't need to worry about special "listening post" facilities to boost Intel; the system's CAP works fine in that regard. The important thing is that it maintains a 1:1 contest between Intel values to moderate the results, removes the ability/need for multiple systems to work together on a mission, and makes Intel a long term investment that still has an economic cost to use offensively. Then we don't have to worry about individual Intel points or a military intel pool. You also can't have Intel in another empire's space, but that is less of a concern now that you can reasonably build up Intel in your systems and perform missions against enemy systems quite a distance away. The difficulty levels for missions then act as our ultimate balancing factor, as they can make missions quite a bit harder to complete. 1-5 difficulty seems to work pretty good. I'm glad that you like this change! It seems like it should work, and will make the rules more straightforward with fewer elements to track. I have to figure out how this dovetails into diplomacy, but I think limiting one system to aid on a diplomatic action is going to keep the spirit of the breaking/declaring modifiers intact. Thinking about the invasions, what should happen to Intel infrastructure when a system is conquered? It seems likely that it would be reset to zero, as the spy network that the original system owner has built up is lost in the invasion. Use it to give a bonus to any Guerrilla actions taken by the, former, owner of the colony. Actually I would say to let the owner choose, and then roll for success. Preserve for future use. Would help for Insurgency missions, etc. Expend itself to inflict casualties the turn of conquest. It would have to after the battle, but before the occupation really starts. That way if they killed the last combat unit a militia could for and liberate the planet. Just a few options off the top of my head. Maybe randomize what the local Intel chief does. That could represent a combo of what he thinks is best and what he is able to do. For one of my solo games while playtesting an undisclosed upcoming VBAM product currently undergoing a complete overhaul, I liked the way I did Intel. It was different than the product's, or 1E/2E for that matter. Then you had a bank of Intel Points representing the CIA, etc. You could have 1-4 per controlled system depending on system importance. They also cost 10EP. They could be spent on offensive intel missions, or allocated to systems for defensive use, or held in the pool. Mission Success had a base 25% chance, modified by the other power's treaty with you - the friendlier relations were, the easier missions were. Also modified by the type of intel mission. Each Spy raised your chancce by 10%, while each counter-spy lowered it by the same. Max Intel Pool you could allocate used the same chart as the intel pool limit (based on system importancce). The first point merely allowed the mission, while additional points raised the success chance just like a spy would. You could not allocate more Intel Pool than the number of Agents you have on the target world. Intel Pool spent on offensive missions was lost, spent. Intel Pool allocated to your own systems was only lost if they were needed to defeat the mission. So, if you won by 30% and had two Intel Pool there, you'd keep them, but if you had 4 Pool you'd lose one (because only one was needed to succeed). Agents themselves were only lost as a result of the dice. If the attacker rolled in the top 25% needed for victory, he lost one agent (two if the dice were doubles). If the attacker rolled in the bottom 25% needed for victory, then the defender lost one agent. *Running* the missions was fast and easy, and worth the investment, while noting where agents were was a bit of a pain. It didn't cost more EP or Intel to run a mission on a distant enemy world, but getting the agents there took a while. Note that missions to locate enemy Agents were handled completely differently, but the odds of being caught were low and the mission didn't require Intel Pool - although you *could* spend Intel Pool to raise your chances, it didn't raise it by enough to be worth doing it everywhere. So we ended up with an agent getting caught every once in a while (affecting the relationship score), but it mostly wasn't worth the hassle of checking every system every turn with such low odds of success - the better investment was counter-intel agents.